Celebrating Sydney's amazing weather, perhaps? 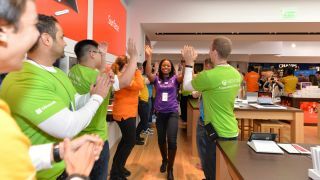 Nestled in what is arguably Sydney's most popular shopping strip and a just a street over from the flagship Sydney Apple Store, the newly announced Microsoft retail store in Pitt Street Mall is an interesting play from the technology giant. But having launched its original Microsoft retail store in the US back in 2009 and expanded to 111 stores across the US, Canada and Puerto Rico, you have to wonder why Microsoft has decided to expand internationally now, and why Sydney is the first city on its roadmap. "We opened our first store in Scottsdale when we launched Windows 7," starts Jonathan Adashek, GM of Communications and Strategy for Microsoft stores. "And when we started that we knew we wanted to create an amazing shopping experience and technology buying experience for our customers. We had a target list of places where we wanted to go and when the time was right we wanted to make an international expansion. Sydney has been on that list since the beginning." But why now? Admittedly, 2015 is set to be a rather big year for Microsoft, with the company not only launching its next generation Windows 10 software, but also focusing even more on hardware with the Xbox One, Microsoft Band and Surface line of products. But the reality of the Sydney store's timing, it seems comes down to the wonders of opportunity. "It's an exciting time at Microsoft, it's an exciting time in the technology space, so now is a natural time for us to expand," Adashek told TechRadar. "When you get an opportunity to get a spot like we have in Westfield Sydney right there in Pitt Street Mall, it's too good to pass up. So it was really easy when you get that opportunity, it makes you look and go "this looks like the right move for us – let's go. We've been wanting to do it, and now here's the right opportunity." 111 retail stores across North America is no small achievement, but it is a rather skewed demographic. You could almost be forgiven for thinking that the decision to launch in Sydney – a tech-loving market to be sure, but still one of a limited population compared to European cities – is a kind of beta test for a more aggressive retail roll out across Asia Pacific. Adashek denied that was the case, however. "We don't have any other international stores to announce today, but what I'll tell you is that I wouldn't see it as a test so much as you're going to get the same experience if you're in our Sydney store or New York Store or Scottsdale store," he said. "You're going to get an amazing store experience that's going to deliver you the choice, value and service that we know customers are looking for when they're making technology buying decisions, so in that regard I wouldn't call it a test." With 6,000 square metres to fill in the Sydney venue, there's not going to be a shortage of Microsoft products on display when the Store opens to the Sydney public later this year. "The store is a place that you're going to get the best left to right view of our ecosystem in a retail shopping experience that you will anywhere. So if that's a phone, an all-in-one, a tablet PC, an Xbox, accessories, software, whatever it is - you're going to get that great experience," Adashek explains. This doesn't necessarily mean that the days of Australians waiting for Microsoft to launch a first party product in Australia months after the US are gone though (yes, we're referring to you, Microsoft Band). That said, Microsoft has historically used its retail presence to champion its new products like the Microsoft Surface and Microsoft Band.